When I was at de Breidagen a few weeks ago, somehow none of the yarn really wanted to come home with me. My bank account was about as happy as I was disappointed. The only things I bought were supplies – from Stof tot Verven – to start dyeing my own yarn, and these three skeins are the result. The dark blue one in the back was my first attempt. I didn’t do anything special, just some blue dye in a pot. It ended up looking kind of denim-like because some spots took a lot less dye than others. It’s not extra-ordinary, but I like it. For the purple one in the middle I decided to try something different. I mixed up some purple dye and let the yarn sit on the heat for about half the necessary time before I sprinkled in some dry red dye. That I left to do it’s thing for a few minutes before stirring it in. The end result is a beautifully semi-solid reddish purple with some quite red spots. 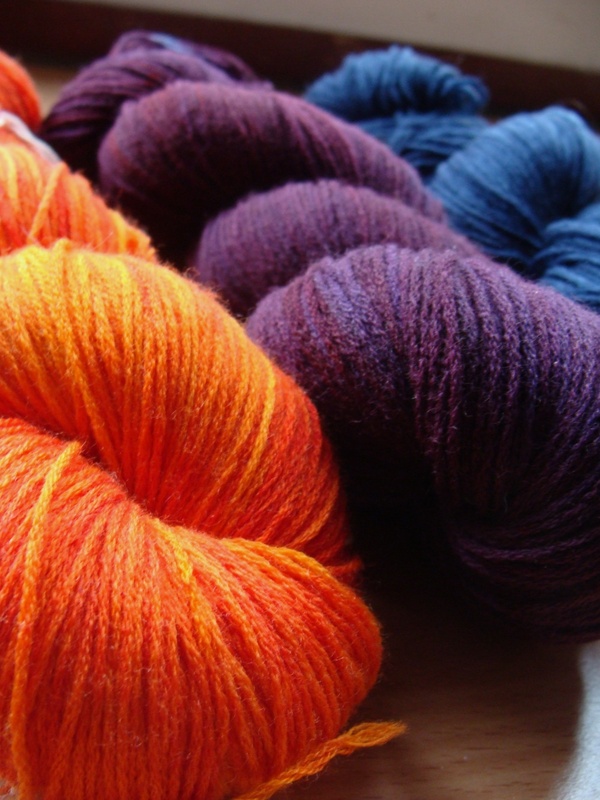 The third skein is my favourite, even though I’m not normally a fan of orange. I was originally going for a soft coral, but as you can see I got BRIGHT orange instead. This one was dyed similarly to the purple one. I started with yellow, but instead of sprinkling dry red dye over it, I poured a dye solution over it. This is probably my favourite method, because the colours flow into each other beautifully. The skein goes from deep, reddish orange to some sort of golden yellow. The only downside of this whole thing is that I decided to practice on a batch of undyed yarn that I got a few years ago and absolutely hated to knit with. So now I have yarn that I hate to knit with, only in gorgeous colours that I DO want to knit with… Perhaps I’ll try weaving with them. At least there the splittiness won’t be as much of a problem. I absolutely adore the bright orange and, like you, it’s not a colour I would usually go for. These would be perfect for Hexipuffs!